This is where the ball drops on New Years Eve. Over a century ago this area was called Longacre Square. 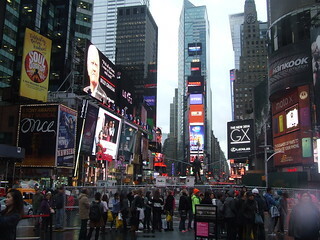 In 1903 the New York Times newspaper constructed the lighted building in the center. The Square was renamed in honor of the newspaper. On New Years Eve 1903 the newspaper celebrated on the Square and the New Years Eve tradition continues today. The Times also launched in 1928 the news "zipper", which displayed a continuous row of lights shaped as words. The Square became a place for people to discover the news of the day.